1 How to cut the grapes? 2 How to cut the grapes in the winter? 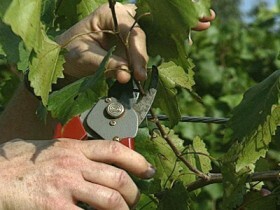 Pruning grapes - the main condition for obtaining excellent harvest. What else should be cut grapes? To berries were large, fast-maturing, to ensure that the plant health. After pruning grapes stoically withstands all the trouble, associated with winter weather, eg, frosts. How to cut the grapes? To begin with the working tool. Pruner must be sharp ends, to slice obtained with one push. Then the wound will not be as painful for plants. The healing process will be faster. To properly perform pruning, you must know the structure of the grape bush. Before you start to crop, decide for yourself, leave some vines, and which do not need. Grapes has a barrel and "sleeves", on whose branches the annual vine, bearing fruits, and replacing the knots with shoots. so here, trunk leave about a meter. Sam "sleeve" cut off, but only to the vines, which may replace him. It should be thick and strong, characterized health. On the new "sleeve" will remain a kidney, that the next year will be the new vine. 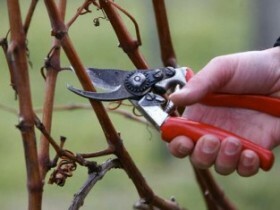 When pruning should be left on the vine 5-7 eyelets (kidney), since many first two kidneys occurring varieties of grapes may be empty shell. Important! The cut must be perpendicular and not leave stumps. How to cut the grapes in the winter? Vine should be in autumn, when it is harvest. For newbies, are just beginning familiarity with the cultivation of grapes, it is important to note, that bears fruit only last year the vine. If the plant is not yet bear fruit and did not survive the first winter, it is not necessary to cut. This work is in vain. But the perennial branches should be cut without regret, since they are useless. Nor gather the grapes from them. 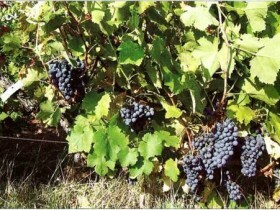 Multi-year vine is considered to be already the, which is more than twice wintered. If left, it will take effect in the young shoots. If properly cut grapes, observing all the points, you can count on a great harvest of large and sweet berries. can be made from grapes not only wine. It also serves as a gazebo, which are hidden from the summer heat. Trimmed bush looks well maintained and becomes proud to host. After all, trimming, you can create a plant to your preference.